Here is an assortment of Kitchen Knives I've been working on and feel are ready to be added to my line of knives. I've had a lot of folks who really enjoy my work want something for general kitchen use so here we go... I hope you like them. These Asian style kitchen knives have a bit of tradition to them and a whole lot of my own influence. All three of these blades are made from my 400 plus layer "forced random" pattern damascus forged from 1095 and 15N20 high carbon steels. The Sujihiki-style (top) has a chisel grind and a 7 7/8" cutting edge (13" oal), the Kiritsuke-style (middle) has a double grind and a 7 1/4" cutting edge (12 1/2" oal) and the Pettsuki-style (bottom) also has a double grind and a 4 7/8" cutting edge (9 3/4" oal). All three knives have fullered "button" guards with my "antiqued" finish and beveled, 2 piece wooden handles. The handles themselves are stabilized and multi-dyed Presentation-grade Maple Burl wood with throats/spacers of matching stabilized and single dyed Maple Burl wood with an etched carbon steel set pin in each towards the back of the handles. 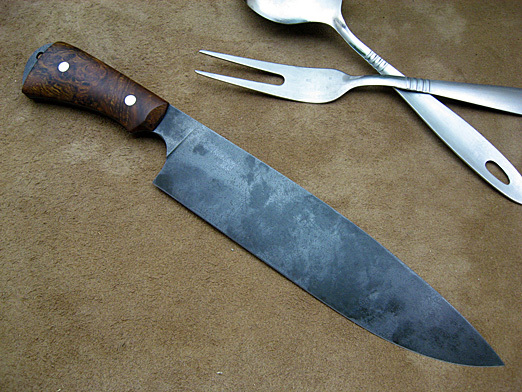 This Butcher-style knife is made from wide 15N20 industrial high carbon band-saw steel. This knife is 13 1/2" long overall with a 8 3/4" cutting edge. The blade is 2" at it's highest point (spine to edge) and just over 1/16" at the spine with a convex ground edge. The blade has my "antiqued" finish for a great look and easy maintenance (also helps prevent corrosion) and the handle scales are set with stainless steel handle bolts. 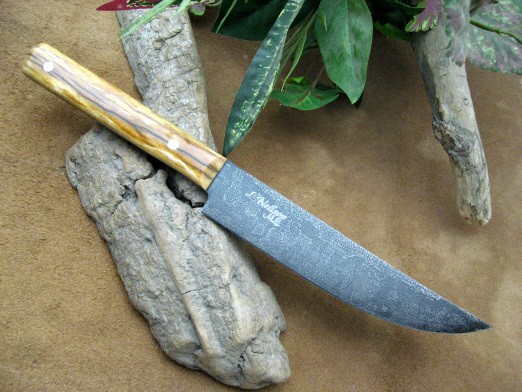 The knife here is shown with Cocobola wood handle scales. OK, it's time to show those Delmonicos who's boss. Here's a new style steak knife from my mountain forge to your dinner table. 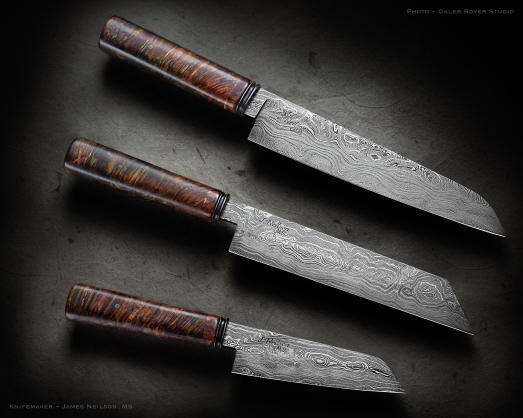 These full-tang steak knives are forged from 400 layer high carbon damascus steel done in a "random" pattern. The profile is similar to my scandi-bushcraft knives but, these knives have full bevels/grinds. The handle scales are A-grade Desert Ironwood Burl and are secured with stainless steel handle bolts. These knives, like all of my full-tang damascus pieces have etched tangs all the way around the handle. Feel free to inquire about a single knife or a whole set (as shown) to match your needs. This "Utility" Kitchen knife has a blade forged from CruForge-V steel with a 6" cutting edge, a .145" spine (at it's thickest) and has an overall length of (just under) 10 1/2". This knife has a "dropped" tip profile, is full-tang and also has my "antiqued" finish to help keep the knife "low maintenance" and prevent corrosion. The handle scales are "dark" Desert Ironwood Burl done in a "palm swell" style and are secured with stainless steel handle bolts. This will make a great "kitchen cutter" or the start of a set. When you order the 28oz. Ribeye at the famous HUSK Restaurant in Charleston, SC it will be served with one of my own "antiqued" Saw-blade Steak knives. The blades are 5 1/2" with an overall length of just over 10". The blades are 1/16" thick 15N20 steel with my "antiqued" finish. The full tang handle is between stabilized Giraffe Bone scales secured with stainless steel handle bolts then polished to a high shine. 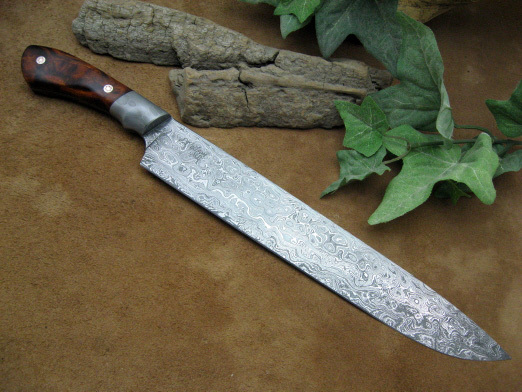 This is a large, full-tang kitchen/carving knife with a blade of 400+ layer damascus done in a "raindrop" pattern. The blade has a 10" cutting edge, approx. 1 1/2" high (spine to edge) and 15" overall length with a flat spine and rounded thumb rest area. The bolsters are ball-bearing canister damascus with hidden pins. The handle scales are A-grade Desert Ironwood Burl done in a "palm swell" style secured with stainless steel handle bolts capped with tri-tone mosaic pins. 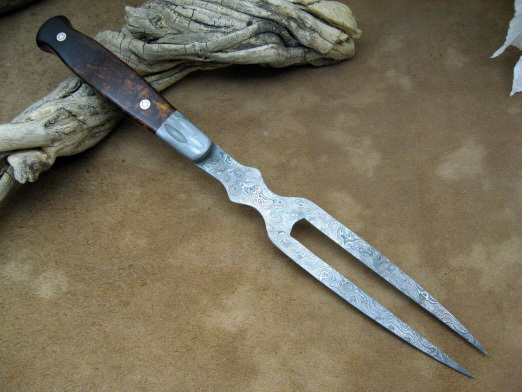 This is a large, full-tang Meat Fork made to match the "Big Carver" knife above. This Fork is made of 400+ layer damascus done in a "raindrop" pattern. The tines are approx. 5 1/4" long with an overall length of 13 3/4". The bolsters are ball-bearing canister damascus with hidden pins. The handle scales are A-grade Desert Ironwood Burl done in a "palm swell" style secured with stainless steel handle bolts capped with tri-tone mosaic pins. 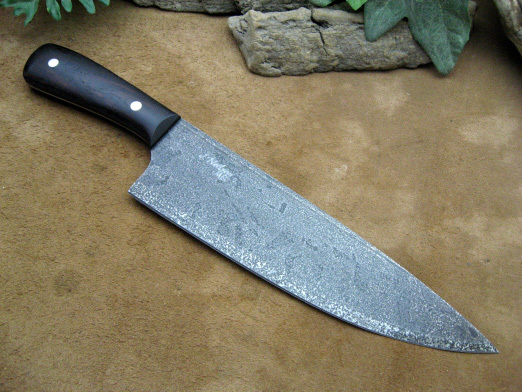 This "Utiltiy" Kitchen knife is forged from 52100 high carbon steel with a hand-rubbed finish. The blade has a full-grind, is 5/32" at it's thickest, approx. 1 1/2" high (spine to edge) and has an 8" cutting edge. 12 1/2" overall length. The handle has brass bolsters with brass handle bolts securing stabilized Maple Burl handle scales to the "fish-tail" tang. 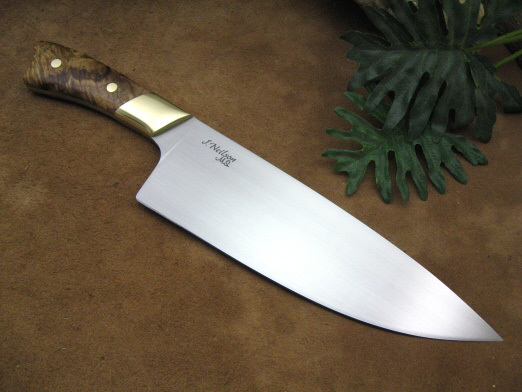 This Chef's knife is forged from 52100 high carbon steel, edge-quenched with an 8" cutting edge and is 2" from spine to edge with an antiqued finish, about 5/32" at it's thickest. The handle scales are Desert Ironwood Burl with an open pommel and secured with stainless steel handle bolts. The overall length of the above piece is 12 1/2" overall. 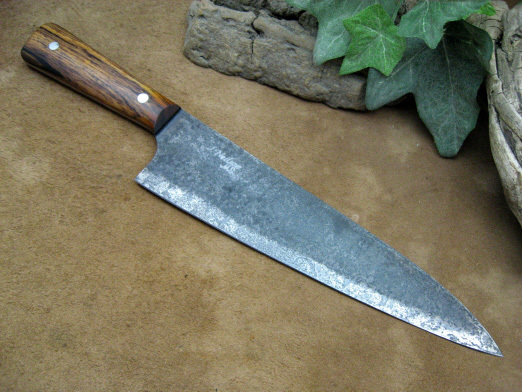 This "French-style" Chef's knife is forged from 52100 high carbon steel with an 8" blade and a hand-rubbed finish. 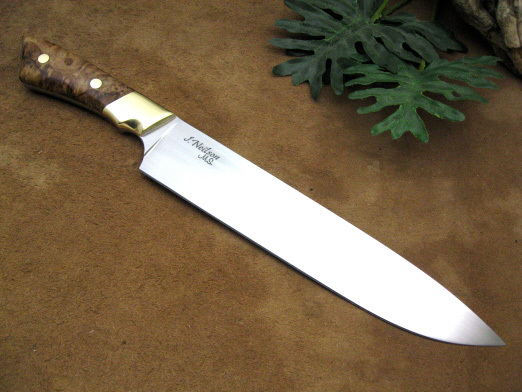 The knife is 5/32" at it's thickest and is 2 1/4" high. The knife has brass bolsters, handle scales of stabilized Maple Burl wood and is secured with brass handle bolts on a "fish-tail" pattern handle. Here is a nice Carving Set done in saw-blade steel with my "antiqued" finish. First off is a standard Carving knife with an 9 3/4" cutting edge (approx. 14 1/2" overall). This knife is just over 1/16" thick at the spine with a convexed edge. The matching Fork is done in the same steel with the same finish. The tines are just over 4 3/4" with an overall length of 13 3/4". 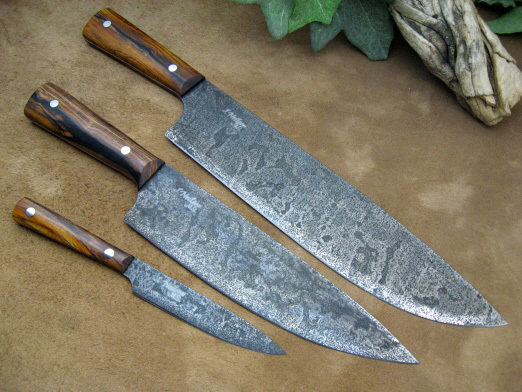 Both pieces have A-grade Cocobola wood handle scales and are finished off with stainless steel handle bolts. 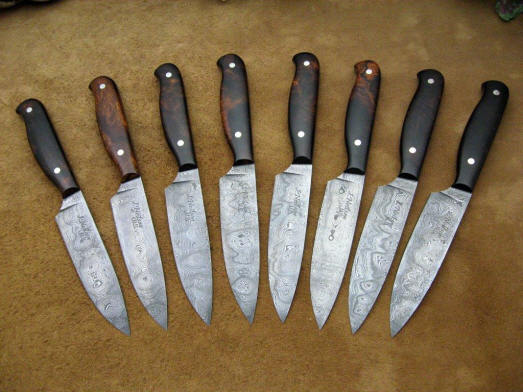 These German-style Chef's knives are made from wide industrial high carbon band-saw steel (15N20 or L-6 depending on the blade). These knives are 14 1/2" long overall with a 10" cutting edge. The blades are 2 3/16" at their highest point (spine to edge) and just over 1/16" at the spine with a fine ground/sharpened edge. The blades are treated with my "antiqued" finish to help prevent corrosion and the handles are set with stainless steel handle bolts. 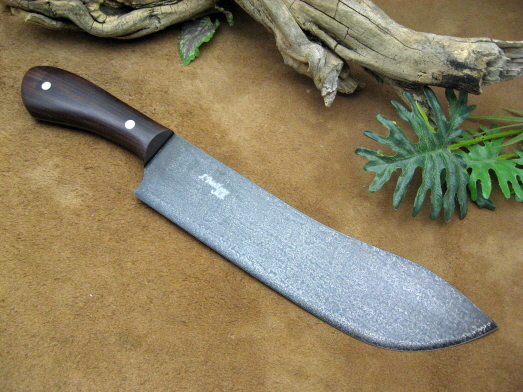 The knife above is shown with Cocobola wood handle scales. These French-style Chef's knives are made from wide industrial high carbon band-saw steel (15N20 or L-6 depending on the blade). This knife is 12 1/2" long overall with a 8" cutting edge. The blade is 2" at their highest point (spine to edge) and just over 1/16" at the spine with a fine ground/sharpened edge. The blades are treated with my "antiqued" finish to help prevent corrosion and the handles are set with stainless steel handle bolts. The knife above is shown with Cocobola wood handle scales. This is a 3 piece Chef's set of my Saw-blade kitchen knives. The set is made from wide industrial high carbon band-saw steel (15N20 or L-6 depending on the blade). 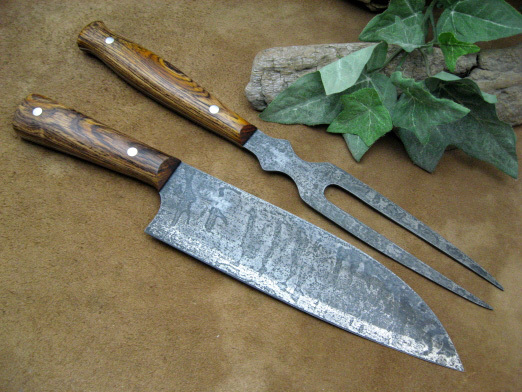 This set included a German-style Chef with a 10" edge, a French-style Chef with an 8" edge (like the Chef knives below) and a Small Boning/Paring knife with a 4" edge. These knives are just over 1/16" thick at the spine with a convexed edge. The blades are treated with my "antiqued" finish to help prevent corrosion with Cocobola handle scales set with stainless steel handle bolts. This Boning knife is made from industrial high carbon band-saw steel (15N20 or L-6 depending on the blade). This knife is approx. 15" long overall with a 9" cutting edge. The blade has a long sweeping edge and is just over 1/16" at the spine with a fine ground/sharpened edge. The blades are treated with my "antiqued" finish to help prevent corrosion and the handles are set with stainless steel handle bolts. 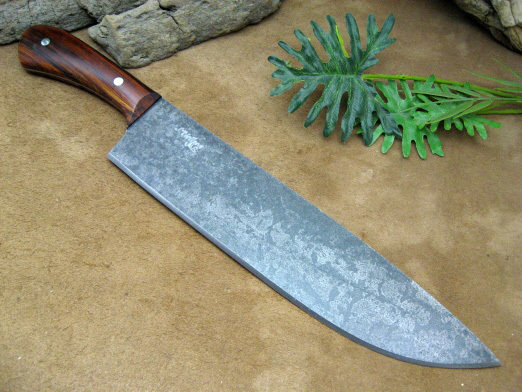 The knife above is shown with Cocobola wood handle scales. This Gyoto-style Chef's knife is made from wide industrial high carbon band-saw steel (15N20 or L-6 depending on the blade). This knife is 12 3/4" long overall with a 8" cutting edge. The blade is 2" at it's highest point (spine to edge) and just over 1/16" at the spine with a fine ground/sharpened edge. The blades are treated with my "antiqued" finish to help prevent corrosion and the handles are set with stainless steel handle bolts. 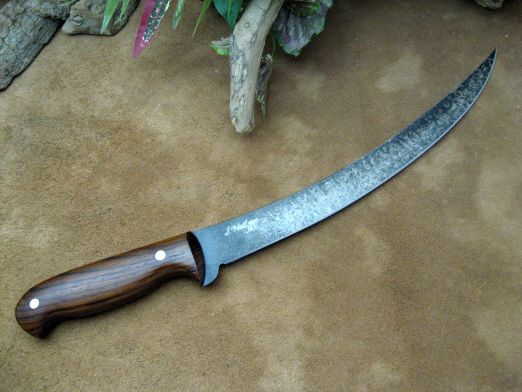 The knife above is shown with Cocobola wood handle scales. This Santoku-style Chef's knife is made from wide industrial high carbon band-saw steel (15N20 or L-6 depending on the blade). This knife is 12 3/4" long overall with a 8" cutting edge. The blade is 2" at it's highest point (spine to edge) and just over 1/16" at the spine with a fine ground/sharpened edge. The blades are treated with my "antiqued" finish to help prevent corrosion and the handles are set with stainless steel handle bolts. 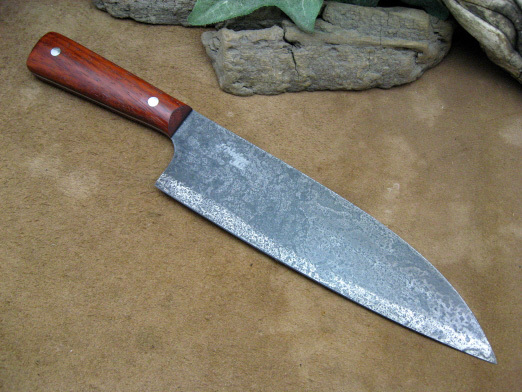 The knife above is shown with Red Padauk wood handle scales. Here is a nice (and a little different) Carving Set done in saw-blade steel with my "antiqued" finish. 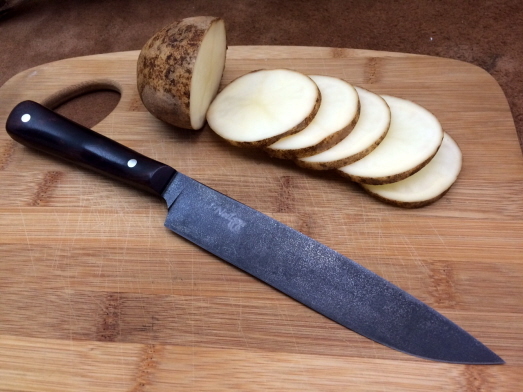 First off is a Santoku-style Chef's knife with an 8" cutting edge (approx. 13" overall). This knife is just over 1/16" thick at the spine with a convexed edge. The Fork is done in the same steel with the same finish. The tines are just over 4 3/4" with an overall length of 13 3/4". 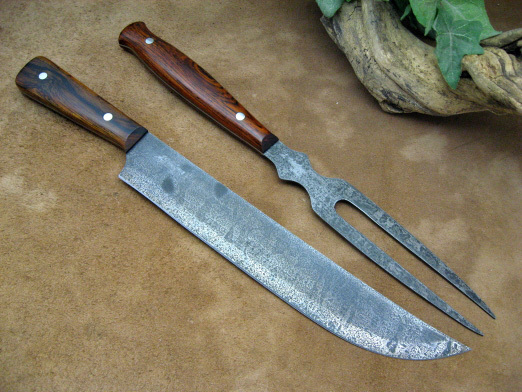 Both pieces have A-grade Cocobola wood handle scales and are finished off with stainless steel handle bolts.